LiveWorkPlay has posted a new project on Fundchange, an initiative of Ideavibes Marketing that is sponsored by TELUS. 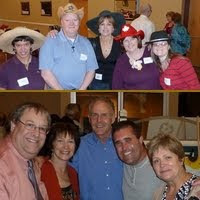 LiveWorkPlay participated last year and raised $5000 in support of international travel for our members. TELUS matched these donations for a total contribution of $10,000 which helped to keep costs low for the trips! The new project Strengthening Family: A Feast For The Senses, A Feast For The Soul is about increasing the accessibility of the popular LiveWorkPlay Family Feast events, which will take place in September, December and March. This is an opportunity for people with intellectual disabilities and their relatives to come together with other families to make connections and share conversation over a meal and local entertainment. Special guests will include community volunteers, employers, and others who help in building an Ottawa community that includes and values people with intellectual disabilities. With Fundchange support and in partnership with St. Anthony's Banquet Hall, LiveWorkPlay will be able to offer Family Feast admission at just $15 per person, which will include a 4 course meal and entertainment. In addition, those who are challenged by the admission cost will be included through a discreet and welcoming process. People with intellectual disabilities often experience severe isolation, and their family members often feel alone in tackling daily barriers to housing, employment, and an active social life. LiveWorkPlay Family Feast events bring families together in friendship and solidarity! We KNOW these events are great (click here for the Facebook video evidence) this project is all about the community coming together to make ACCESS affordable for all! There are many different ways to help, it only takes a second, and two of the choices are FREE! This diagram (click to enlarge) explains it all! 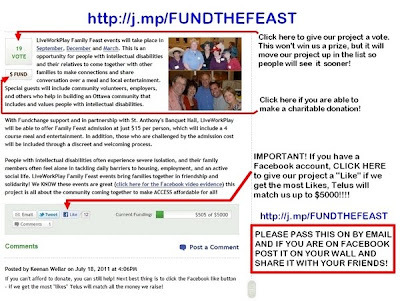 Just go to http://j.mp/FundTheFeast when you are ready!